I’m reflecting on relationships and a remarkable friend who rescued a promise I could not fulfill alone. It all began weeks ago when Beth phoned. We met several years back during the Horticultural Therapy Association Conference at MSU. 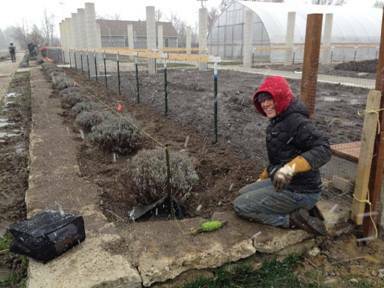 Afterward, Beth, a landscape architect, hired my staff and me to install a lavender promenade in the Lafayette Greens Urban Garden downtown Detroit. What fun wearing a construction helmet on the hottest day in July. A heart for connecting plants with people, Beth asked if I would provide lavender for another community garden she’s installing in Detroit. She needed 60 Grosso plants for her GrowTown Garden. I had at least 60 healthy Grosso plants that needed rescuing. Enthused, I forgot my bum knee and offered to dig them up from my fading lavender fields. I also forgot the variety is named Grosso because it’s huge. We set a date for my site visit to GrowTown. When I exited I75 west onto 7 Mile Road, my heart pained at the trash, emblematic of the neighborhood’s ruin. The Yacama Street sign flashed me back to 1954 and my family’s residence as tender transplants from Kentucky. The large, sparkling windows of Brown’s Creamery on the corner of Yacama and Seven Mile were long gone. I wept for the wasteland. Dear Reader, with this faith in Beth’s vision for GrowTown, I phoned a friend who might help rescue my promise. She said yes. MaryEllen comes from stout Finnish stock. As a child, she dug up worms to fish with her father in their Minnesota homeland. Her husband’s career as a photographer brought her to Michigan where they raised three children. You learn such intimacies working shoulder-to-shoulder in fields planting, weeding, and harvesting in mercurial weather. “I’ll bring my shovel,” MaryEllen said. Under Tuesday’s spring sun, we cut weed cloth and yanked staples from around thirty lavender plants, dug them out and bagged them by 6 p.m.
What high praise for living things! Blessed be my rescuers, for they shall inherit bundles of lavender.